Our current Website is intended to convey the range of studio pottery and ceramics that we produce, the environment in which we live and work and the context which gives meaning to our pursuit. Our working studio is situated in the historic heart of Swellendam in the Overberg region of the Western Cape in South Africa, on the N2 national road, halfway between Cape Town and the Garden Route. We are open daily and visitors are welcome to browse and enjoy the environment. It is advisable to call ahead if traveling from afar. The Website will also give those unable to visit the studio an opportunity to view our work and environment, select a piece or commission work from us. 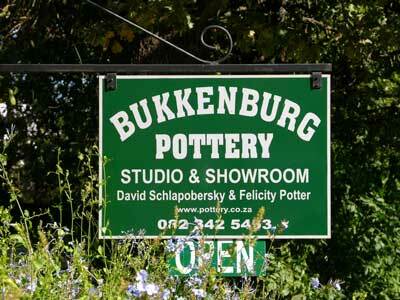 Studio Pottery and Ceramics – Hand-made in Swellendam, South Africa. Open Weekends held regularly at the studio in Swellendam, often hosting guest exhibitors representing a variety of disciplines. Accommodation at the studio in a luxury self-catering two en-suite bedroom guest cottage. “It is every person’s obligation to put back into the world at least the equivalent of what he or she takes out of it” Albert Einstein.